In Canada and West Greenland, Atlantic walruses (Odobenus rosmarus rosmarus) are commonly found in productive shallow water areas with their latitudinal range extending from the Ontario coast of Hudson Bay ( ~ 53°N) to southern Kane Basin ( ~ 79°N). Most sightings information of Atlantic walruses in Kane Basin come from late-nineteenth and early-twentieth century Arctic expeditions with aerial surveys seldom being performed in this area and none being conducted to date in waters around northern Ellesmere Island—a largely understudied area overall. We conducted photographic and visual aerial surveys in the Canadian jurisdiction of northern Nares Strait and Lincoln Sea in August 2018. We documented novel photographic and observational evidence of several Atlantic walruses in Archer Fjord, Nunavut—a fjord that extends westward from Lady Franklin Bay. The least cost path of travel between the northern distribution limit of the high-Arctic Atlantic walrus population and the entrance to Lady Franklin Bay is approximately 255 km. 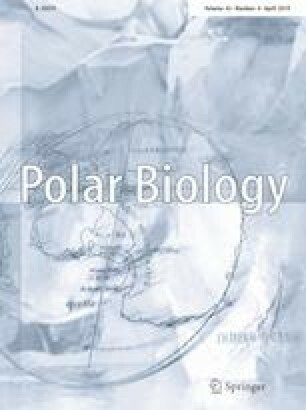 Coupled with a previous observation of Atlantic walruses in northern Kane Basin in 2009 and one adult male in Archer Fjord in 2010, the observation of eight Atlantic walruses in Archer Fjord in 2018, indicates a possible update to the northern range of high-Arctic Atlantic walrus to Archer Fjord. Little is known of the physical-biological dynamics of northern Ellesmere Island; therefore, this is a priority study area to obtain baseline ecological data for the last Arctic area predicted to retain multi-year sea ice to inform Arctic conservation and management. The online version of this article ( https://doi.org/10.1007/s00300-019-02499-z) contains supplementary material, which is available to authorized users. This research is part of the Multidisciplinary Arctic Program (MAP) - Last Ice, funded by Fisheries and Oceans Canada and logistical support was generously provided by Polar Continental Shelf Program, Environment and Climate Change Canada and Department of National Defence at Canadian Forces Station (CFS) Alert Military Base. Special thanks to Major Caden Stiles, Commanding Officer (CO), Rene Hansen, Station Warrant Officer (SWO) and Rob Lutz (Alta SWO) at CFS Alert. We thank Richard Moore for reviewing the photograph. We also thank the Hunters and Trappers Association of Resolute Bay for their support of the project. We thank our Kenn Borek Ltd. crew—Captain Doug Westerrsund, First Officer Oliver Wery-Groilard and Technician Lawrence Deane. We thank Christian Lydersen and an anonymous reviewer for comments that improved the manuscript. DJY and CGC are supported by NSERC (PDF, CGS, VF) with additional support from MEOPAR (PDF) and the W. Garfield Weston Foundation (PDF) to DJY.